When you envision a birthday party what do you see? A cake, balloons, party hats, and a room full of your closest friends, right? Well when the almost 2-year old Border Collie, Baillie, was asked the same question, her answer was identical. Nancy Wendt is the founder of the party planning company, The Party Ville. And while her agenda is to party, she doesn’t limit her clientele only to those with two feet. For her dog Baillie’s 2nd Birthday, Nancy planned and hosted a dog party. Friends of Baillie and their owners were invited, dog and human cake and refreshments were served, handmade decorations for the ballerina theme added the perfect touch of elegance, and a great time was had by all. For the most part, people consider parties a human only event, and never even consider partying with their pets. But in the USA and Latin America, this mindset has already begun to change. Nancy has started her company in Luxembourg, and hopes that over time the thought of having a dog party will become second nature, like a housewarming party or a wedding. 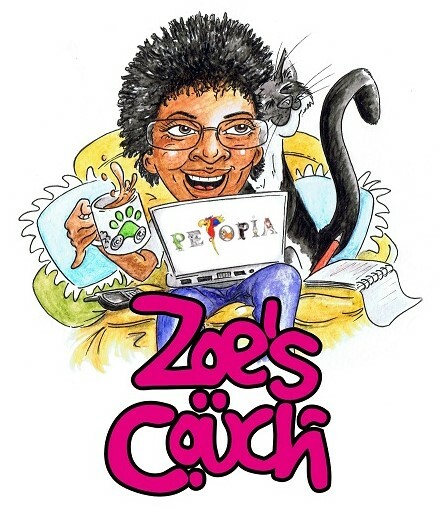 Petopia was intrigued by such a creative and original idea, and thought that sharing the experience with others could help jump-start the trend. After attending Baillie’s 2nd Birthday, Petopia interviewed Nancy to learn more about the source of her inspiration and her envisioned future for The Party Ville. When did you start your company and what inspired you? I started planning parties when I was 17 back in high school and once I moved to Luxembourg I continued doing it while writing about it at The Party Ville blog. However in 2016 after losing my full time job, I decided to try to do the party planning as a business, and so far it’s looking very promising. I now have a small team and each day we get more and more party requests! What inspired me to create The Party Ville was the possibility to create moments of happiness with decorated theme parties, while taking care of the environment. After planning and decorating parties for 5 years in Luxembourg, I had collected a big amount of party supplies that I wouldn't want to get rid of, so I decided to plan parties for other people and to reuse as many party supplies as possible and replicate that feeling of happiness with more people. In your opinion, what differentiates you the most from other event planning companies? I think there are many things that differentiate The Party Ville from other event planning companies, one of them is, for example, that we own a large inventory of party supplies available for rent so there is less waste and we can reuse the things allowing our prices to be very attractive. Finally at The Party Ville we use as much Eco-friendly materials as possible such as bamboo, wood, paper, etc. For us it is important to take care of our environment, so we choose carefully our products to offer the best quality to our clients. And as we want to share our favorite party products with as many people as possible, we decided to open a party shop in Luxembourg city from February 2017! How did you come up with the idea of including “dog parties” into your business? Well it just came from a personal need, after getting our dog Baillie, we started to meet a lot of dog owners and our dog made a lot of dog friends. My husband and I made a lot of new dog owners friends and we thought it was a good idea to celebrate our dog's first birthday with them, after all The Party Ville, it's all about celebrating important moments in life in a creative way, so we thought if we can customize parties for kids and adults, why not also customize parties for dogs? What other types of events do you plan and which type is your most popular? We do practically all types of events from weddings, adults parties, baby showers, kids parties, company parties, baptisms, to dog parties. I guess when it is about celebrating special moments there is no limit, as long as we can use our creativity to create a memorable party. So far the theme parties have been the most popular, as it leaves us room to decorate and transform a place into the desired theme. What do you enjoy most about party planning? I love many things about party planning, I guess this is why I have been doing it for over 10 years. But if I could choose the top 2 things I love the most, I would say that one of them is the feeling of creating something from scratch while making a wish come true, transforming an empty room into a theme, it could be a circus, a winter wonderland, a tropical paradise, etc. The second thing I love the most is to be able to make people happy, to transform their wishes into reality and put a smile on their face, I love exceeding their expectations and creating a nice memory of an important moment in their life. What was your inspiration behind the ballerina theme for Baillie’s party? For the ballerina theme party for Baillie, I was inspired first by the color of her pink nose, I knew I wanted something pink, because it would match perfectly with her nose. I wanted to create first of all a dog costume that would be both comfortable and pretty, so I had the idea of creating a dog tutu, as I already had done some for little girls. From there came the idea to do a ballerina dog party. 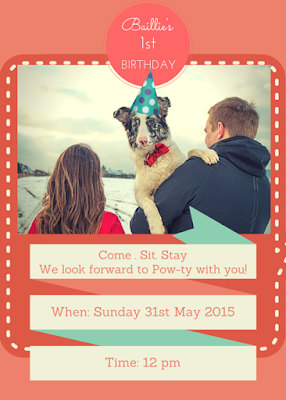 Do you think that dog parties are something that can become a trend or popular in Luxembourg? Dog parties are getting more and more popular in the USA and other Latin American countries, so I don't see why they wouldn't be popular in Luxembourg as well. After all I think that Luxembourg is a very dog friendly country and people seem to have money and time to take good care of their dogs, it’s just that I think that they might never had thought of the idea of celebrating their dog's birthday with a dog party. But if they have a small community of dog owners and their dogs are friendly with other dogs I don't see a reason why they shouldn't celebrate together! How many dogs were at Baillie’s 2nd birthday and the breeds? At Baillie’s 2nd birthday party we had around 10 dogs that were all friendly with each other. We had a Golden Retriever, Pug, French bulldog, Beagle, Bichon Frise, Shetland Sheepdog, two Belgian Tervuren shepherds, and Baillie, who is a Border Collie. What would you say to people considering having a dog party in the future? I would tell them go for it, it is so much fun and if your dog is so special for you why not celebrate together? Just gather your dog lover friends and have some fun! 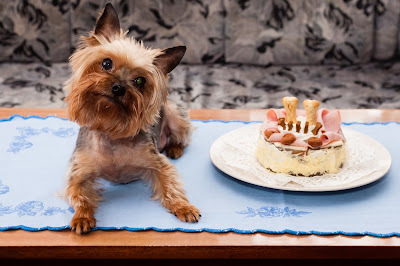 What was the type of dog cake that you served? For this year's dog party we created a water based ice dog cake and the dogs loved it. The idea came after seeing how much Baillie loved ice pops. What other dog parties have you planned in the past and what were the themes? What is your favorite type of party to plan and why?